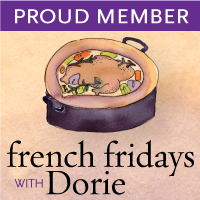 This month I have been sitting off of the French Fridays with Dorie. The reason ? Well, so far June has been all about Fishy Fridays with Dorie. So I was staying away until I read some of the reviews and decided to try them out this week. First one I tried was the Salmon Rillettes. The other Friday, while reviewing Dorie's Tuna Rillettes I had described what rillettes are and their place in French cuisine. 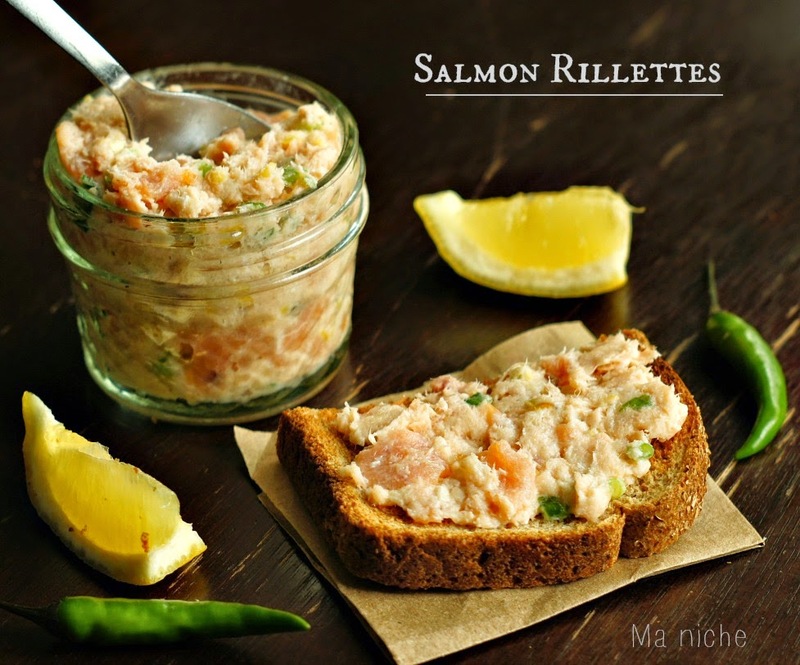 I will not go into that, however I must mention that rillettes are fast becoming my favorite recipes for preparing fish. 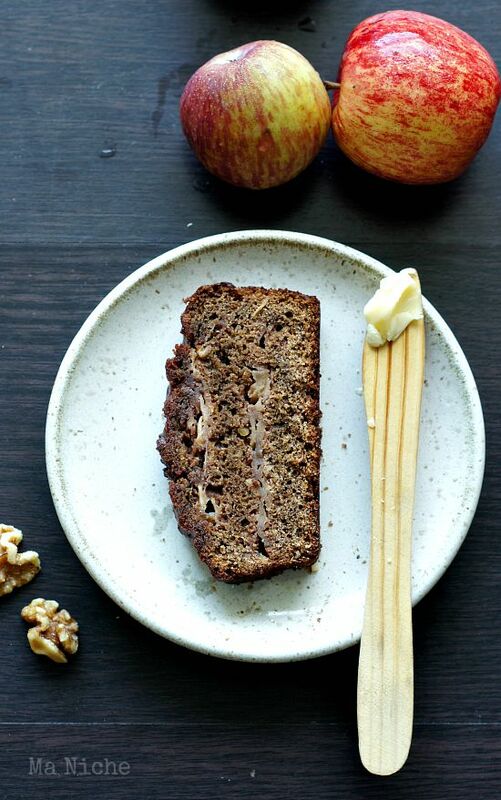 They are quick, easy and tasty ! Unlike the Tuna Rillettes, this one requires a bit of cooking. Only a bit. You cut a salmon fillet into small cubes, poach them for a minute in a simmering bath of half and half mixture of water and white wine speckled with tops of spring onion, some spices, namely red bay leaf, white peppercorns, coriander seeds and salt. You then strain everything into a strainer, drain and discard the spices and vegetables, transfer the salmon cubes to a bowl and mash them with the back of a fork. Next you toss in some smoked salmon, lemon zest, a red chile pepper, finely chopped shallots into the bowl, mixture everything well, then add a dollop of butter, some lemon juice and bit of crushed pink peppercorns to it. Finally you adjust the salt in the rillettes and chill the mixture for two hours before serving. Visit French Fridays with Dorie to know what the other members thought about this spread. 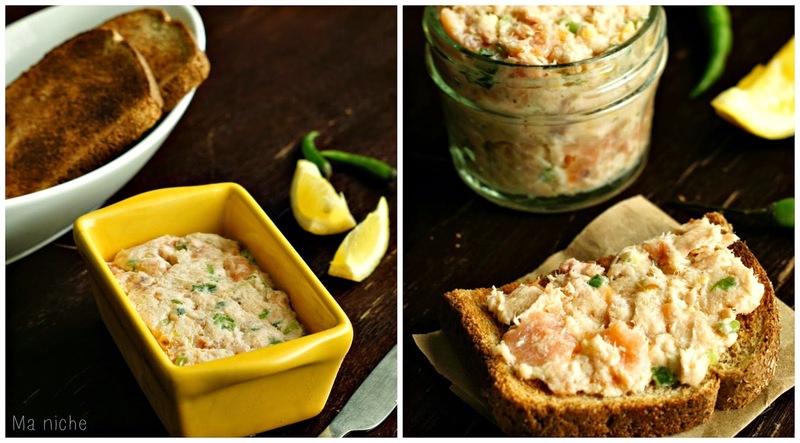 You can find the recipe for the salmon rillettes here . For more such delicious recipes order your copies of Around my French Table and join the Doristas in this tasty adventure. You made this exactly the way I wish I made it. The spices needed to be blended into the salmon. Glad you enjoyed it. I enjoyed the salmon rillettes also more so than the tuna. You are right with the fishy Fridays. Enjoyed your fish and you got lovely results! 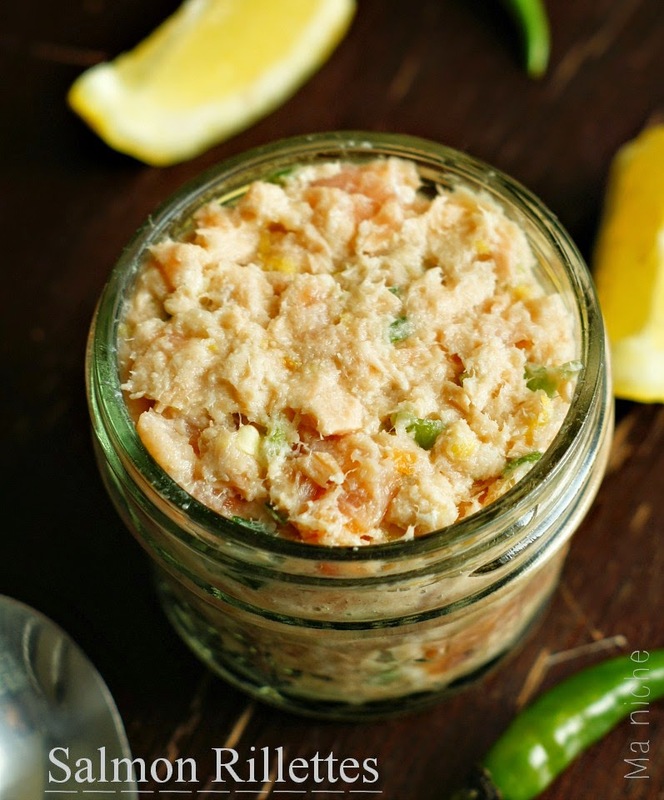 I have never tried a fish spread before, but I like the idea of mixing all the spices into it! 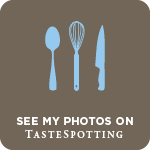 I loved the salmon rillettes. Interesting idea to blend all the spices right in - I think I'll try that next time I make it.